T625 Multirole Helicopter of Turkish Aerospace Industries (TAI) has successfully performed its first flight on 6th of September 2018, at its facilities in Ankara, Turkey. 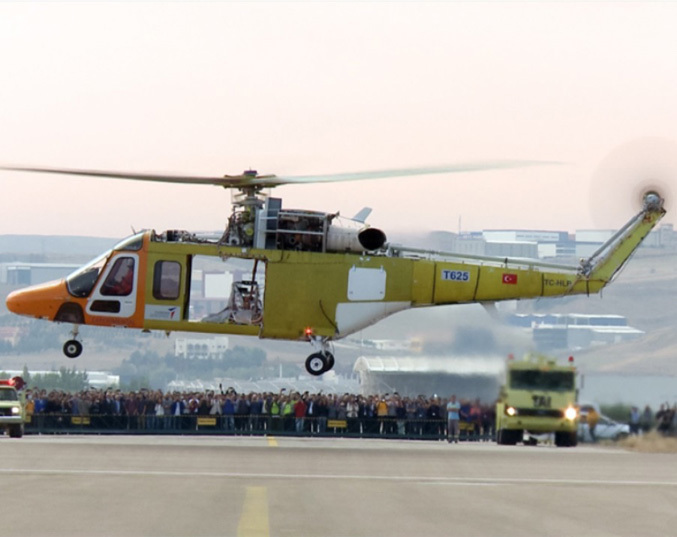 The first prototype of new generation, 6 tone, light intermediate, T625 Helicopter which is completely designed and developed by Turkish Aerospace, completed its maiden flight after several ground tests. During its 20 minutes flight, the aircraft performed as expected with an assessment of the helicopter’s general handling, transmission and rotor systems. T625 is a new generation, twin engine, 12 seated + 2 crew helicopter specifically designed for Military, Paramilitary and Civilian purposes. Its state-of-art avionics, visionics, new technology transmission and rotor systems are designed for exceptional performance at hot and high harsh geographical conditions. T625 Multirole Helicopter is planning to meet a range of new export opportunities and requirements in the worldwide market as a game changer and new player, by exceeding the multi-mission requirements for adverse weather conditions with its MTOW/Cabin Size ratio, highest levels of safety and operational benefits for operators with EASA certification. TAI was established on June 28, 1973 under the auspices of the Ministry of Industry and Technology in order to reduce the foreign dependency in defense industry of Turkey. With the decision of meeting the combat aircraft requirement of Turkish Air Force (TurAF) with F-16s, TAI Aerospace Industries, Inc. (TAI) was established by Turkish and US partners in 1984 for a period of 25 years with the aim to realize the manufacture, systems integration and flight tests of F-16 that would be delivered to TurAF. TAI was restructured in the year 2005, just before the 25 years of period came to an end, with the acquisition of foreign shares by Turkish shareholders. Along with this restructuring, Turkish Aircraft Industries and TAI have merged under the roof of Turkish Aerospace Industries, Inc. (TAI) and have broadened its activities. Today, known as Turkish Aerospace Industries, Inc. (TAI) has become Turkey's center of technology in design, development, modernization, manufacturing, integration and life cycle support of integrated aerospace systems, from fixed and rotary wing air platforms to UAVs and satellites. In addition, integrated logistics service is also provided for all products designed and produced by TAI.